In case you forgot, G.I. Joe Retaliation is still set for release next March, after being delayed in May to undergo a 3D conversion. 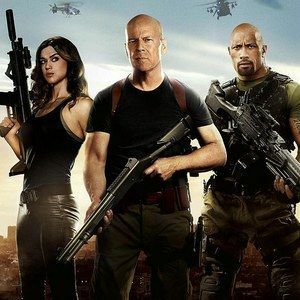 Paramount Pictures has unveiled an international trailer for director Jon M. Chu's action sequel starring Dwayne Johnson, Channing Tatum, and Bruce Willis. Watch as the explosive action unfolds in this latest look at the Hasbro adventure. And just for fun, we're throwing in another international poster you may have missed back when this was derailed on its way to theater screens (GoPooCock CogPly is how you pronounce it in Mother Russia...We think...).